One huge difference between many small businesses and their larger counterparts is their pricing strategies. Or lack thereof. Exceptional cases aside, one major gaffe a lot of small biz entrepreneurs – new and old – make is the lack of a real pricing strategy. The most popular strategy we’ve observed in small businesses across all industries is the almost universal devotion to Cost-Plus pricing. Determine the break-even price for an offer. This is done by calculating all the costs involved for production, marketing, and distribution. Figure out the markup. This is based on break-even figures, sales objectives, and how you think customers will react to your price. It works well enough in a lot of cases. Bigger market realities can be mostly included when accounting for margins. Cost-plus emphasizes historical value – not the actual value of the offer now. 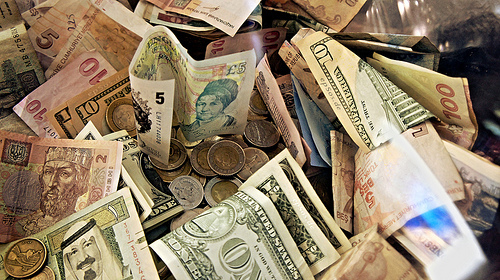 Cost-plus largely bypasses how your customers see real value. It ignores the role your competitors play in determining that perception. Some costs/values are necessarily difficult to account for. Example, there might be more value in dumping non-moving stock to free up warehouse space than there is in listed break-even price of your items. That means replacement value is not adequately addressed. Cost-plus does not account for opportunity costs. The bigger players use a ton of other pricing strategies. Many of them still use cost-plus, for some things sure. But medium-large enterprises tend to use a whole host of different pricing strategies that help them to get the most out of their resources and help condition their market at the same time. The strategies below can be used by literally anyone regardless of size in the right context. We’re not saying you should dump cost-plus right away, but there is so much more to pricing than many of us realize. Please remember that these are only general descriptions, and plenty of enterprise-specific pricing strategies require a combination of the ideas below. Different sources may also have alternate names for these strategies, and we’ve tried to include as many of the popular alternate names as we could. 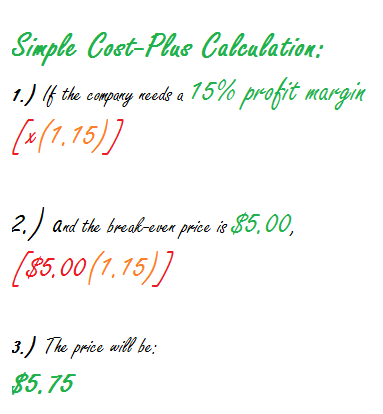 Contribution margin-based pricing aims to max out the earnings from a specific offers, based on the difference between the price and variable costs (contribution margin per unit) and on assumptions on the relationship between the product’s price and the number of units that can be sold at that price. This is a modified form of cost-plus where all costs are recovered. The price of the product includes the variable cost of each offer plus a proportionate amount of the fixed expenses. Products are sold at a high price so that only a few sales are needed to reach the break-even point. Sellers sacrifice high sales volume for higher profits per unit moved. This is often used for new inventions, to recoup the costs of development, and to take advantage of price-insensitive early adopters willing to spend a premium to be the first. This can also give the impression of a more upscale offer at the expense of losing sales to competitors. In this method, you offer the product or service you actually want to move more of alongside other usually more expensive offers. This will often cause customers to gravitate towards the product you actually want to sell. When your offers are priced higher than your competitors, you can price key items lower so as to either lock customers into your system (such as with DSLR’s and lenses) or to make them brand converts. A loss leader or leader is a product sold at a low price (i.e. at cost or below cost) to stimulate other profitable sales. This would help the companies to expand its market share as a whole. One commonly cited example is inkjet printers, which are often sold at a loss in order to stimulate ink sales. When and incremental profit is better than no sale at all, once could choose to reduce prices so that they are as close to break-even as possible. This is often used with perishable items. Prices are set at odd numbers just shy of a “psychological barrier”. For example, $4.99 and $5.00 are essentially the same, but $4.99 just looks that much lower. This is where buyers pay any desired amount for a given commodity, sometimes including zero, or in other cases at a minimum set price. This has some limited utility for quickly disposing of unwanted stock, and for promotions. Here, prices are set low – sometimes at a loss – in order to gain a foothold in a market. Prices can be normalized once a set “promo phase” is done. Also known as “undercutting” or aggressive pricing aims to drive out competitors from the market. Small business clearly are at a disadvantage from businesses with more resources. This is illegal in many countries. This is where prices are set “artificially high” so that your offer will be perceived as more aspirational. This may or may not be necessarily justified. This sort of pricing is extensively used for luxury goods and specialist hobbyist equipment. This is different from value-based pricing as that strategy requires the brand to have a specific appeal independent of price. Price discrimination involves putting different prices for the same product in different segments to the market. Thanks to customer tracking technology, it’s now possible to give individual customers wildly different prices depending on their ability or willingness to pay. A subset of price-discrimination pricing. The most commonly cited example of this is airline tickets, where nearly every passenger pays different prices, and last-minute bookings can be expensive, regardless of seat availability. Happens when a player in the market sets the tone for all the sellers. This usually happens in specialist businesses where there are few sellers, but can also happen in cases where are cartels. Any kind of pricing intended to take advantage of people’s normal reactions. Odd number and penetration pricing are obvious examples of this. All kinds of pricing can be viewed as psychological however, since you are looking for specific reactions – sales or patronage – from your customers. Less useful for small businesses. This pricing method involve pricing offers to produce a particular rate of return on investment for a specific volume of production. This is more often used by utilities and heavy machinery suppliers due to the much higher sunk costs involved. This is why Apple and Adobe products, Harley Motorcycles, and Gibson Guitars continue to sell like hotcakes even when they are incredibly expensive compared to their competition. When creating this kind of pricing strategy, it’s necessary to understand the alternatives available to customers as well as your own brand’s cachet. Even if competitors produce offers that are qualitatively similar on paper, it’s still entirely possible to jack up prices based on history, design, crowd association, etc. This is slightly different from premium pricing as there usually has to be an intangible or hard-to-duplicate aspect to an offer that the competition cannot easily match. You cannot go this route if you have no rep to speak of, which is why brand development can be so crucial. The limit pricing involves setting prices lower than the average cost of production or just low enough to deter competitors from entering a market. This can be illegal in many contexts. BONUS: Not using price symbols at all. In a Cornell study on diners published in the International Journal of Hospitality Management, patrons of an “upscale casual” restaurant paid up to 8% more when presented with menus without a dollar sign ($). Branding expert and Time Magazine Influential 100 honoree Martin Lindstrom says, “The dollar sign is a symbol of cost, not gain.” Seems that when we see a currency symbol, it sets a signal to our brains to protect what resources we do have. Engineering New Product Success: the New Product Pricing Process at Emerson Electric. A case study by Jerry Bernstein and David Macias. Published in Industrial Marketing Management. What pricing strategies did we miss? Hate this article? Love it? Tell us in the comments below!